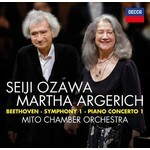 the first official joint recording from Seiji Ozawa and Martha Argerich - two iconic artists performing Beethoven's First Piano Concerto. The historic new album also includes Beethoven's First Symphony with the Mito Chamber Orchestra. Argerich and Ozawa first performed together nearly 40 years ago in October 1979, when Argerich made her sensational Boston Symphony debut - her rendition of Prokofiev's Third Piano Concerto was described as "incendiary" by the Boston Herald. Since then, their performances have lit up the international concert stage and their friendship has grown. Yet the pair have never officially recorded together - until now. This landmark new Beethoven recording is Ozawa's first release since his Grammy award-winning Ravel album in 2015. It was captured during live performances in January and May 2017 in Mito, Japan. The concerts earned glowing reviews and the album went straight to No.1 in the Japanese Classical Chart. The recording is also the first international release by Ozawa and the Mito Chamber Orchestra: a hand-picked ensemble of international players drawn from Japan, Europe and North America. The orchestra was established in 1990 under Ozawa's direction and has collaborated with some of the world's most celebrated musicians - from Szymon Goldberg to Mstislav Rostropovich, Andras Schiff to Ton Koopman. "Whenever I am working with them," says Ozawa, "I feel I have an invaluable opportunity - as have the orchestra's musicians - to reflect on what it really means to 'do music' once again." Seiji Ozawa first recorded a Beethoven symphony half a century ago (the Fifth with the Chicago Symphony Orchestra in 1968). He studied Beethoven with Hideo Saito, the celebrated Japanese conductor, cellist and teacher who had studied in Berlin and Leipzig in the late 1920s with Emmanuel Feuermann among others. Ozawa famously went on to study with Herbert Von Karajan in Berlin and as Leonard Bernstein's assistant at the New York Philharmonic in the early 1960s. Martha Argerich continues to be one of the most extraordinary pianists performing today. Together with Seiji Ozawa, this formidable duo bring spontaneity and insight into Beethoven's work and their new album marks a significant moment in recording history.